Iff: This is from a recent game of mine (the last move by white is marked). I think this position should be good for black as he already made profit in the lower right corner and white still has a weak group to settle - is that so? But what is the proper way to play for black now? I have marked some move candidates that I am thinking about - can someone please explain to me how to properly handle such a position? Are some of the marked points above clearly better then others (and if so why) or is the choice purely a matter of taste? Are there any general principles that one can apply in such positions? 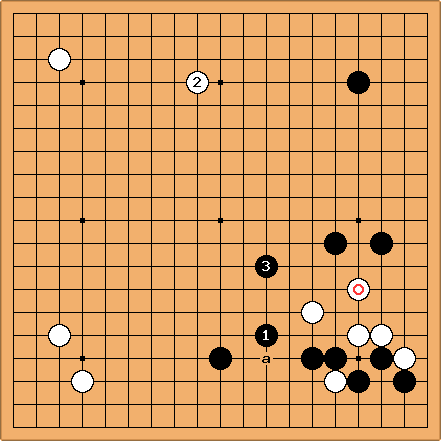 Tapir (~1k): Hi, one principle is "playing near live stones is small." Since the white stones on the right are not alive yet playing in that area may be big... but g is a bit far away, i is not so good shape (white can simply push through with the diagonal play). I would prefer on of the point in between - white will jump out in a way and even f may be sente now. So black profited on both sides and still can make the next big move then. As I started to play 3-3 these days, I wonder that nearly all kyu players are eager to play the shoulder hit not even considering other approaches like x and y - after the making profit with the sequence above I would like x (and after the expected white y) black can follow up around c (e.g. z) for a comfortable game. Dieter: White's stones are not yet alive but they are not exactly weak either. It's not easy to find a profitable attack immediately. It may be strong enough for Black to lose sente attacking it. It's rather inefficient than weak, so taking sente may be the right "punishment" here. I agree with Tapir's plan to build at the top, either by c (or the point above it) directly, or by approaching at x first. Shoulder hitting at b surely presses White into a globally low position too. The left and lower side are not that interesting now, because all positions are fairly safe now, although h will become big very soon. Can white really ignore ? White should have used the opportunity to play the atari at , followed by the attachment at . There is no reason to try to pull out the White stones as such. As a group they have no role to play in the game except as a target for Black to attack. So the play at a is meaningless. If White played anything around there it would be the peep at b. 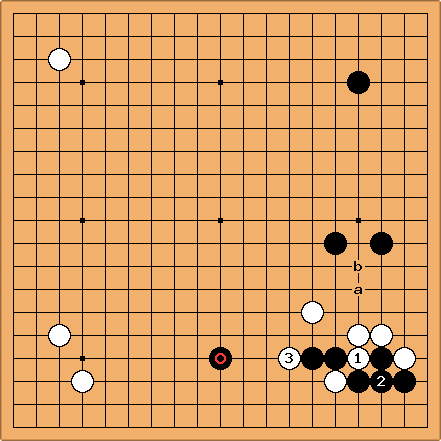 In the lower right, White's best chance is to cut off the marked Black stone and attack it in exchange for the White stones in the corner. Failing this, there is no obvious role for the White stones.